A landslide is a downward movement of rock and soil debris that has become detached from the underlying slope. The material can move by falling, toppling, sliding, spreading and flowing. There are many possible causes of landslides these can either be geological, morphological or human-induced. A few of these include saturation of slope material (rainfall), seismic activity (earthquakes and volcanoes), undercutting of cliffs and banks by waves and rivers, removal of vegetation, and modification of slopes. There are many landslide vulnerable areas with high-risk terrain. These include seismic sensitive areas, mountainous areas with high relief, moderate relief areas with land degradation, areas of thick loess and areas of high rainfall. On January 10th 1962, a huge mass of rock and glaciated ice fell down Nevados Huascaran initiating a debris flow. The flow travelled along the river valleys leading from the mountain. It destroyed the town of Ranrahirca, killing 2,000 people. On May 31st 1970, an earthquake measuring 7.9 on the Richter scale occurred 85 miles away from the mountain. The same area affected by the 1962 landslide gave way, burying the town of Yungay. 18,000 people were lost beneath 30 metres of rock. On December 16th 1920 an earthquake measuring 8.6 on the Richter scale started a landslide due to the fine loess material in the area. 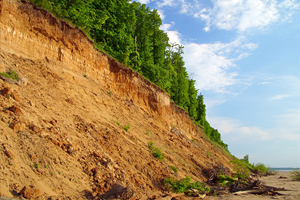 The loess (wind deposited silt) is strong enough to form near vertical slopes which are easily weakened during seismic activity. The landslide flowed down the valleys, burying villages and killing approximately 180,000 people. Extreme temperatures and annual monsoon season led to rapid rock weathering and heavy rainfall. It is also thought that deforestation also played its part in the areas landslide vulnerability. Extremely heavy monsoon rainfall lead to severe flooding in south-east Asia, this lead to landslides in Nepal, killing 500 people. 92% of the population live in the hills or in the lowlands beneath the mountains. A recent series of landslides occurred in El Salvador following an earthquake measuring 7.7 on the Richter scale, killing 585 people. The landslide volume is estimated to be 250,000 cubic metres.